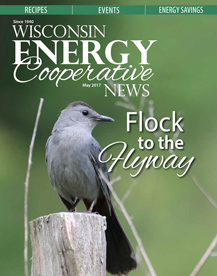 Wisconsin Energy Cooperative News, the nation’s first statewide publication for electric cooperative consumer-members, has been published monthly since July 1940. The magazine has earned its reputation as a reliable, people-oriented publication whose focus is non-rural and statewide issues that affect electric cooperatives. Recognized for quality editorial content, Wisconsin Energy Cooperative News is the principal statewide voice and information source for more than 171,000 electric cooperative member-subscribers. It is many publications in one with local editions customized for each of the member cooperatives. Our priority is to promote the general welfare of cooperatives, their member-owners and the areas they serve.